THE CHANGING FACE OF AIR AND MISSILE DEFENCE With the increasing number of (ballistic) missile-equipped nations and growing geopolitical uncertainty in Eastern Europe, the Middle East and the Asia-Pacific region in particular, Air and Missile Defence programmes and requirements are understandably evolving at a rapid pace. Meanwhile, given the ever increasing threat of radical institutions (both state and non-state) with access to weapons of mass destruction, it is critical that the global air and missile defence community meet once again and discuss how we can best protect our national security and infrastructure against these rising threats. 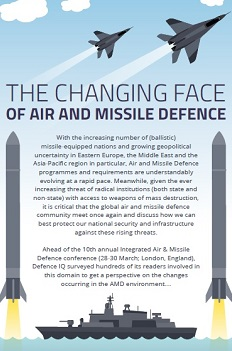 Ahead of the 10th annual Integrated Air & Missile Defence conference (28-30 March; London, England), Defence IQ surveyed hundreds of its readers involved in this domain to get a perspective on the changes occurring in the AMD environment…Read the results of our world wide survey here!